Braided bread dough results in a golden-colored bread with defined twists that make a more attractive presentation that traditional loaf shapes. 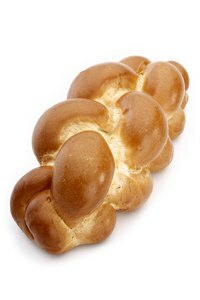 Braiding is the traditional technique used to make challah, or Shabbat bread, but it also works well with other sweet breads, egg-based breads and yeast-based breads. Exact technique depends on the type of bread and bread recipe, but the loaf is typically braided, then allowed to proof before baking. Challah bread is always served in a braided presentation, traditionally braided with six strands for a high loaf. As an alternative, braid one large three-strand loaf and one smaller three-strand loaf. Place the smaller loaf centered on top of the larger loaf and allow the dough to rise. This mimics the look of a six-strand braid with a simpler braiding technique. Experiment with braiding different types of bread, such as brioche, oatmeal or even a loaf of plain white bread. For greater color variation and flavor variety, braid together three or more different bread types. Fluffy, yeast-based cinnamon roll dough looks similar to pull-apart monkey bread when braided. Instead of making a straight loaf with your favorite bread dough, join the ends in the circle to make a braided bread wreath. To braid bread, you need long finger-like dough strands that taper slightly at the ends. Fluffy, yeast-based dough can simply be divided into the desired number of pieces -- three or six -- and rolled on the counter with the palm of your hand to form the strand shapes. The signature fine-grained texture of challah and brioche requires a bit more effort to achieve. After dividing the dough according to the number of strands desired, roll each piece out flat into a shape somewhere between a rectangle and oval. Roll each flat piece into a long tube similar to rolling a piece of carpet. Apply slight pressure while rolling to further divide the small air bubbles in the dough. Arrange the three or six strands in a downward-facing fan shape with separation between each piece, squeezing the ends together where the pieces meet. The fan shape for a three-strand braid is arranged with the center strand pointing straight down and the two side pieces pointing at roughly 45-degree angles in opposite directions. The space makes it easier to distinguish the strands and move them as you braid the dough. Cross the strand on the far right over the center strand. The far-right strand is now the center strand, and the original center strand is now the far-right strand. Move the pieces to the side as needed to maintain separation. Cross the far-left strand over the center strand. The original far-left strand is now the center strand. The original far-right strand was the center strand and is now the far-left strand. This completes the first sequence. Repeat the sequence, starting with the far-right dough strand until you reach the end of the strands. Press the three strand ends together and tuck them under the loaf; repeat with the opposite end. The dough strands for a six-strand braid must fan out wider to leave enough separation between the extra strands. While more complex than a three-strand braid, a six-strand braid also follows a pattern that is fairly simple when mastered. Lift up the strand second from the right and move it to the far left, crossing over the four strands to the left. Lift the far-right strand and cross it over two strands to the left, setting it down at the center. Lift the second-from-the-left strand and move it to the far-right position. Move the far-left strand over two strands to the center position. Repeat the process, beginning with the strand second from the right, until you reach the opposite ends of the six strands. Press the ends together and tuck them under the loaf.